The Economic and Financial Crimes Commission will today (Thursday) arraign a former Minister of Aviation, Chief Femi Fani-Kayode, for allegedly collecting N26m from the Office of the National Security Adviser. The anti-graft agency has earlier filed some fresh money laundering charges against him before the Federal High Court sitting in Abuja. Fani-Kayode is the sole defendant in the fresh charges numbered, FHC/ABJ/CR/140/2016, before Justice John Tsoho of the Federal High Court in Abuja. The EFCC in the fresh case filed five counts, in which it accused the defendant of diverting N26m allegedly received from the ONSA while Sambo Dasuki was in office. 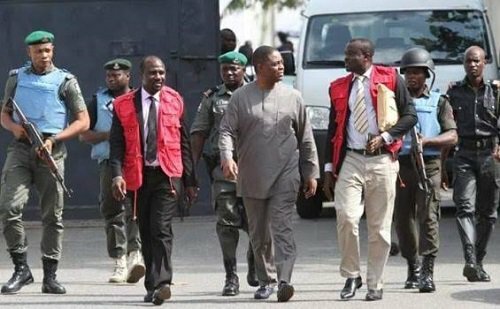 Fani-Kayode, a former Director of Media and Publicity of the PDP Presidential Campaign Organisation, was re-arrested by EFCC operatives while emerging from a Federal High Court room in Lagos. He is standing trial in the Lagos court alongside a former Minister of Finance, Nenandi Usman, one Danjuma Yusuf and a company, Joint Trust Dimension Nigeria Ltd. The trio is facing a 17-count charge of unlawful retention, unlawful use and unlawful payment of money to the tune of about N4.9 billion, a charge they denied. Reports say that the Prosecutor, Mr Rotimi Oyedepo, had concluded the witness’ evidence for the day, and the case adjourned till Nov. 14 and Nov. 15 for continuation of hearing. Meanwhile, the PDP has warned that Fani-Kayode must not die in EFCC custody.